As the 43North startup competition, funded by the Buffalo Billion, enters its fifth year, organizers have made progress in addressing the program’s weak link: winning companies leaving Western New York after their mandatory year here is up. But, in a notable stumble, one company singled out to receive extra funding slipped through organizers’ fingers, moving all but one of its employees to Toronto earlier this year—despite receiving a total of $1 million in investment from 43North. The 43North competition was launched in 2014 to address a weak link in Buffalo’s economy, the lack of startup companies, which experts agree are crucial for economic growth. Winning startups stand to receive anywhere from $250,000 to $1 million in investment. In exchange, they must give 43North a 5 percent equity stake and come to Buffalo for at least a year. Soon, though, a problem emerged: out-of-town winners weren’t staying beyond that compulsory year. In the first two years of the competition, 14 startups came to Western New York after winning; only two still have employees in Buffalo. Of the $14.25 million awarded to companies in the first three years of the competition, just over one-third has gone to companies that no longer have any employees locally. The seven local winners, by contrast, have all stuck around. In response, organizers said they changed the recruitment process, prioritizing companies that would be a good fit for the region. That’s yielded results: six out of eight companies from the 2016 class have stayed – more than in previous years, even though none of them were originally from Buffalo. 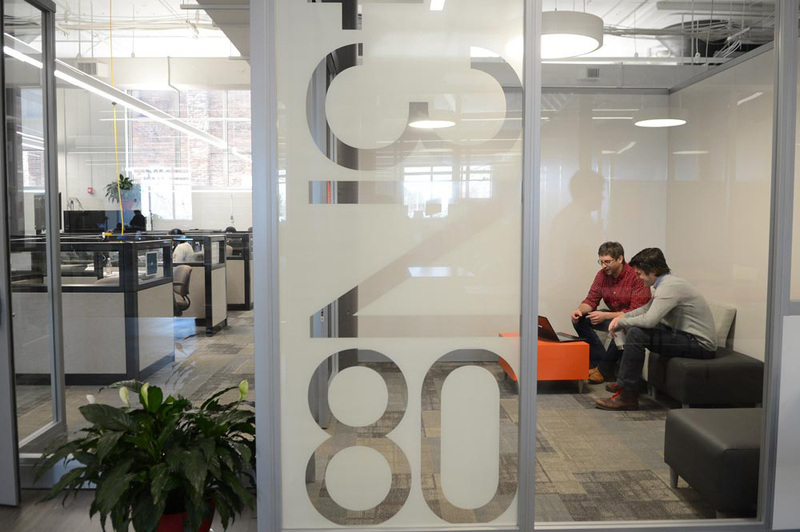 As the competition enters its fifth year, supporters point to the 260 jobs that winning startups have created in Western New York and what they see as a palpable change in the region’s entrepreneurial culture and energy. Alex Gress, 43North’s president since March, said he expects to see more and more companies stay from each year of the competition. “I think we’re seeing results, but I do want to make it clear it’s still very early innings in the process,” he said. His first day in the incubator space on the Buffalo Niagara Medical Campus, early last year, Seyed Nourbakhsh recalled, the chairman of 43North’s board of directors addressed the latest round of winners. At times, those aims have proven difficult for 43North to reconcile. Many startup competitions offer less money—prizes of $50,000, rather than $500,0000—or focus on attracting companies to a specific city, or state. Few do both. It’s a formula that has left 43North vulnerable to winners leaving Buffalo once they’re no longer required to stay. In the first two years of competition, two-thirds of the winners were out-of-town companies. Only two out of 14 still have employees in the region. One received extra funding to stay; another, mostly based in Israel, has just one, part-time employee here, currently working as-needed. So, for the third round of competition, in 2016, organizers looked for companies that would be a natural fit for the region. They wanted to find startups whose motivations for coming to Buffalo would go beyond the lure of the prize money. Sometimes, Gress said, that has meant saying no to promising companies that don’t appear ready to make a long-term commitment to Western New York. Now, when finalists make their pitches live onstage at Shea’s Theater, in the final round of the competition, judges are likely to grill them: Why Buffalo? Why not Silicon Valley? Is it really viable for your company to begin manufacturing here, rather than overseas? So far, the shift in strategy seems to be paying off. None of the eight winners in 2016 were local, but six still have employees in Buffalo, months after their commitment to stay ended. The $1 million winner, Oncolinx, which is developing new cancer drugs, had been working with a University at Buffalo professor for over a year before winning, a relationship that continued after the company moved here from Boston. Now, Oncolinx has three employees here, as well as several interns. It would be “incredibly disruptive for us to move,” said CEO Sourav Sinha. Two of the 2016 winners have opened manufacturing facilities, anchoring the companies here for the near future, at least. Dive Pool Systems Inc. started production of its self-powered pool-cleaning device in March, in a low-slung building in Cheektowaga, a few blocks from the Galleria Mall. Nourbakhsh said he looked at roughly a dozen possible locations and there was “soft pressure” from 43North staff to choose somewhere in Buffalo or the surrounding area. Another 2016 winner, CleanFiber, which makes insulation from recycled cardboard, started its production line in Blasdell earlier this year. “We’re planting heavy metal in the ground in Buffalo,” said CEO Jonathan Strimling. The company has four full-time employees and another seven contractors, who Strimling expects to hire full-time as production ramps up. “We plan to be here for decades,” he said. Still, with early-stage companies, there are no guarantees. HigherMe, which makes software to help retailers and restaurants find hourly workers, had all the ingredients 43North was looking for: a promising business model, a track record of success and a connection to Western New York. Making his pitch to the judges, CEO Rob Hunter mentioned his family’s ties to Rochester and Southern Ontario. In 2016, HigherMe won $600,000, the second largest prize available. One year later, the company was chosen to receive another $400,000 investment, “follow-on funding” to help it grow in Buffalo. HigherMe’s year in Buffalo seemed successful. The company had reached $1 million in revenue, Hunter said. His daughter had been born here, and the company made several local hires, including 43North’s former head of strategy and development. “I can tell you that Buffalo is in the midst of the greatest comeback story in American history,” Hunter said from a podium, accepting the extra funding. But, a few months later, the case for staying in Buffalo was crumbling. Hunter was traveling to Toronto frequently, as the company signed several major deals with Ontario-based customers. “I was tired of sitting in traffic on the QEW when I could have been spending time with my baby daughter,” he said. Additionally, he said, moving to Buffalo had stretched the company across several locations, spreading the executive team too thin. The new hires in Buffalo mostly didn’t work out. “We hired a ton of people locally and unfortunately those people did not generate anywhere near the revenue that people in other areas did,” Hunter said. Less than a year after receiving the additional funding, the company had mostly moved to Toronto, leaving just one employee in Buffalo. Gress, 43North’s president, wouldn’t say why the follow-on funding didn’t come with the same contractual commitment to stay in the region as the original investment. He did say that 43North sets “very clear expectations” that recipients will stay in Western New York, but refused to provide a copy of the funding agreement. The money that 43North winners receive isn’t a grant or a gift: 43North owns a piece of each winning company. Even if winners leave, Gress says, the region still stands to benefit if they become successful. Still, he concedes, organizers would prefer that 43North’s investment in HigherMe was creating jobs in Western New York, rather than in Ontario. Asked whether 43North would change anything about the follow-on funding, or firm up the wording of the agreements, Gress demurred. “We’re going to continue to set very clear expectations,” he said.